An endangered population of giant tortoises has recovered on the Galapagos island of Espanola. 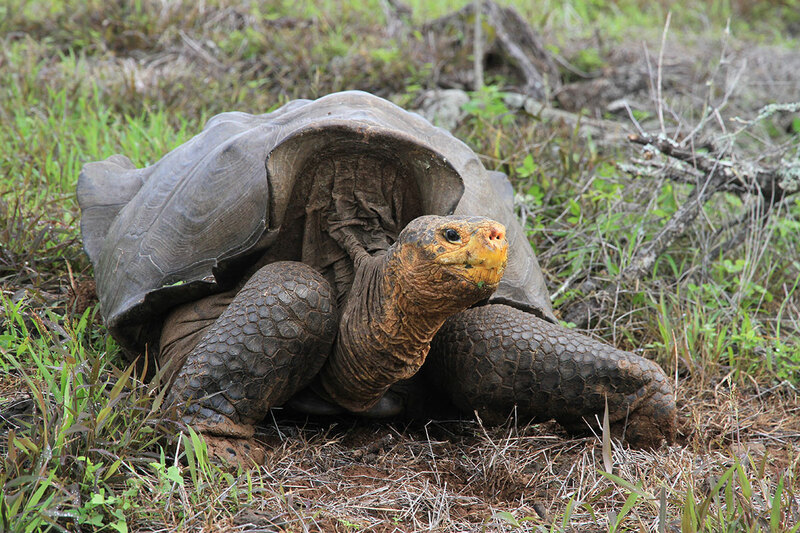 Giant tortoises that were once driven to the brink of extinction on a tiny Galápagos island have made an amazing comeback, a new study reveals. The tortoise population on the island of Española dwindled to just 15 animals in the 1960s, because of damage to their habitat caused by feral goats. Then, about 40 years ago, captive-bred tortoises were released on the island, and now there are about 1,000 of them living and breeding in the wild. Giant tortoises used to be found all over the world, but now, in the wild, they're found only in a few places, including the Galápagos Islands, the Seychelles and the Mascarenes. Whalers hunted the tortoises on Española for food. Fishermen later brought goats to the island in the late 1800s, devastating the native ecosystem and the tortoises along with it. By the 1960s, only a handful of the colossal reptiles were left. To fix the problem, "the first order of business was to eradicate the goats," Gibbs told Live Science. Conservationists brought in trained gunmen on helicopters to hunt down and kill all of the goats. Meanwhile, the Galápagos National Park Service reintroduced captive-bred tortoises to the island, and marked and recaptured them over the years. In the study, Gibbs and his colleagues analyzed 40 years of data collected by the national park service, the Charles Darwin Foundation and other visiting scientists. They found that the tortoise population had stabilized. "What we basically found over time is, about half of the tortoises that were released have survived," Gibbs said. "That’s actually pretty amazing." And the tortoises are breeding. Some of the younger animals found in the last five to 10 years weren't bred in captivity, Gibbs said. The tortoise population is "very secure," he said, and probably doesn't need further human intervention. To find out how the island's vegetation has changed over the years, the scientists measured the carbon content of the soil at different depths. They found that over the past 150 years or so, there's been a shift in the flora from grasses to small trees and shrubs. These woody plants prevent the growth of cacti, which are staples of the tortoise's diet, and make it harder for the animals to move around, the researchers said. So even though the tortoises are rebounding, it will take a lot longer for the ecosystem to bounce back and the tortoise population can fully recover, Gibbs said. Editor's Note: This article was updated at 11:40 a.m. ET on Oct. 29, to correct a statement about where giant tortoises are found in the wild. Follow Tanya Lewis on Twitter and Google+. Follow us @livescience, Facebook &amp; Google+. Original article on Live Science.